If you’re dealing with crooked, crowded, gapped or otherwise misaligned teeth, you’re probably interested in orthodontics. But if, like most adults, you’d do anything to keep metal brackets and wires away from your mouth, we’ve got good news for you: Dr. Isaacson and Dr. Cook, your Oklahoma City dentists, are passionate about providing their patients with a more discreet option in orthodontics. It’s called Invisalign, and it uses clear plastic aligners to gradually shift your teeth into place. Interested? Keep reading to learn more about this incredible option today. Invisalign is an FDA-approved orthodontic treatment that offers adults and older teens the straighter teeth they desire, invisibly. It works using a custom-fit series of plastic trays that you advance through every two weeks. Each time you switch trays, you’re advancing through the treatment — and one step closer to your straighter, more beautiful smile. Privacy. Big meeting? First date? With Invisalign, you don’t have to fret about people focusing on your metal braces. Actually, it’s highly likely that no one will ever even know you’re undergoing orthodontic treatment — all they’ll notice is your straighter, more beautiful smile. Convenience. With Invisalign, you don’t have to worry about making emergency dental appointments for a popped off wire or loose bracket. Just stay on top of your checkups every month and a half, and you’ll enjoy the convenience of clear braces until the treatment is complete. Ease of use. Because Invisalign trays are removable, you don’t have to sacrifice excellent oral hygiene for straighter teeth. Just wear your device for the recommended 20 to 22 hours and you can feel free to remove it as needed for eating and cleaning. Comfort. 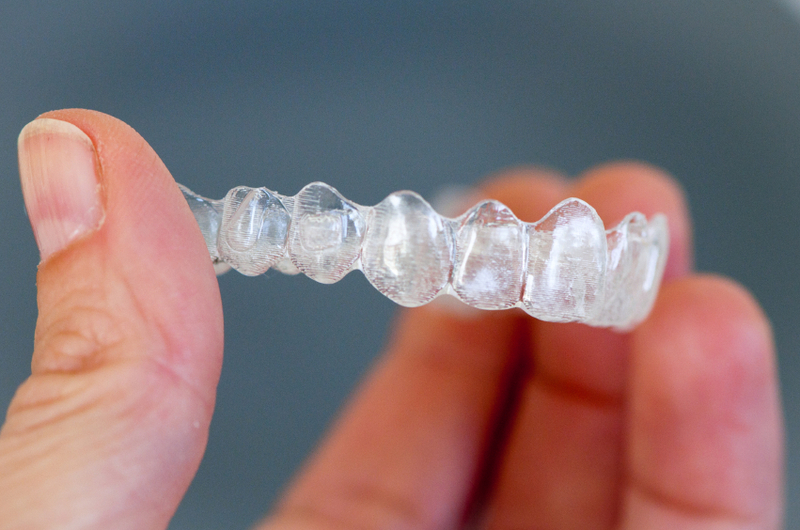 It almost goes without saying that the clear plastic Invisalign trays are far more comfortable than the bulky metal used for traditional orthodontic treatment. Forget blisters in your sensitive gums and cheeks — we’re pretty sure the only thing you’ll ever feel is the progress of your teeth moving into their preferred position. The Invisalign system: it’s clear braces for busy adults and image-conscious teens. Need we say more? If you’re interested in learning how your or a loved one’s smile can benefit from discreet orthodontics, click here to contact Joe Isaacson Dental today. We’ll schedule your appointment for an orthodontic consultation in 2016. Our state-of-the-art dental office is proud to serve all patients in and around the Oklahoma City, OK area, including Bethany, Forest Park, Edmond, Piedmont, Arcadia and all surrounding communities.